A Chilling Account of a Bizarre and Callous Murder. One night in March 1999, fifteen-year-old dance student Rachel Elizabeth Barber vanished. No one could have guessed that she had become another girl's 'perfect' victim. Happy. Beautiful. Talented. She had everything her killer could want. 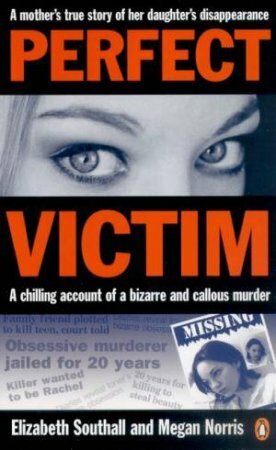 Perceived by crime experts everywhere as one of the most bizarre homicides they had encountered, 'Perfect Victim' recounts two stories: Rachel's mother Elizabeth Southall tells of her family's heart-rending experience - how they lived through unimaginable tragedy, going to extraordinary lengths to prove their daughter wasn't a runaway. Criminal court reporter Megan Norris provides another side of the picture; the analysis, the astonishment of professionals when faced with the killer's weird and unsettling letters, and the police proceedings that led, eventually, to the Rachel Barber case being solved. Confronting and compelling, this is an incredible story about a callous and calculated crime.